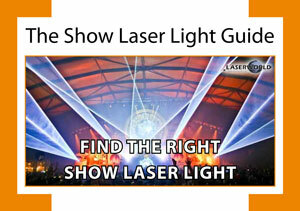 The Show Laser Light Guide - How much is a laser? The cost for a laser system depends on many factors: The performance and quality of the components as well as their alignment and durability define the product price. Show laser systems for home or DJ use are very affordable and can be bought for less than 100 € up to ~500 €. The features of such devices are limited, but are sufficient for the intended field of use. Mid-priced show lasers range from ~500 € up to ~2,000 €. These semi-professional projectors are very versatile and can be used for beam shows, in clubs or discotheques. Professional laser systems start at ~2,000 € and up, can be computer controlled, are very powerful and offer high quality for professional laser shows.